Edit on Nov 8, 2012: Guess what showed up at the US App Store today? (Haven’t managed to find it at the Canadian one yet.) The direct link’s in the caption under the screenshot. If this is too long a read, just go to the product page at http://itunes.apple.com/jp/app/puzzle-dragons/id493470467?l=en&mt=8 and oggle at the cuteness! But the real incentive to check it out is the totally machine-translated Engrish description! Those 3 critters may be cute and happy but they are totally out to murder your little band of monsters. I downloaded this semi-social, cute puzzle/monster collecting freemium game on a whim after purchasing Epic Astro Story from the Japanese App Store. Unfortunately, I don’t believe the game is available outside of Japan. Developed and published by GungHo Online Entertainment, it’s a dungeon crawler kind of like those old school, first person turn-based RPGs. 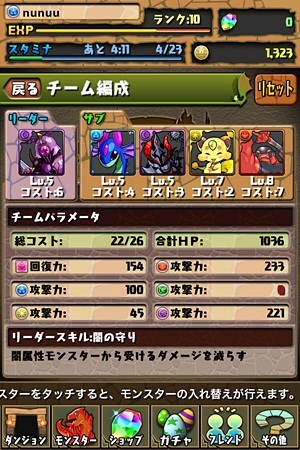 In Puzzle & Dragons, you “control” a party of 5 monsters. Well, there’s six in the screenshot above since you can always bring a guest along with you! These monster guests are courtesy of other players but I’ll get more into that a bit later. 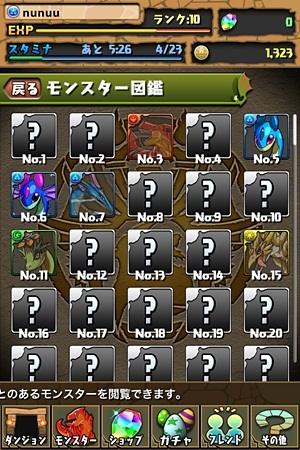 Puzzle & Dragons is super simple to figure out! Just match up rows or columns of the same type of coloured orbs/elements based on fire, water, air, light, and darkness. The minimum is 3 but if you manage a group of 5+ elements, it will invoke an area attack where you will hit all enemies on the screen. Of course, this is all dependent on whether or not your party contains monsters of the same elements as those orbs you match up. 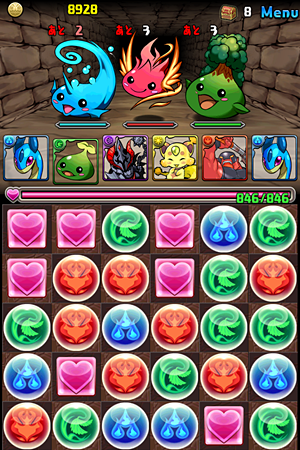 Although this whole matching colours business is quite old by now, Puzzle & Dragons differs in that it’s turn-based, and within your turn, you can move any one orb anywhere in the puzzle grid. This allows you to set up combos to deal massive damage. However, selecting a puzzle piece triggers a countdown which limits the amount of time you have to figure out where to move it. On top of that, there’s a number on top of an enemy’s head that indicates the number of turns you have before it attacks so you have to think fast. While grouping trios of the elements is all fine and dandy, you won’t get very far that way. To effectively get through a dungeon, you will need to strategize and create combos. Combos are basically multiple groups of 3 or more elements that are achieved within your turn. The main advantage is the increase in damage output and also the bonus effect of replenishing a greater amount of health if the combo includes a string of 3 or more Hearts. 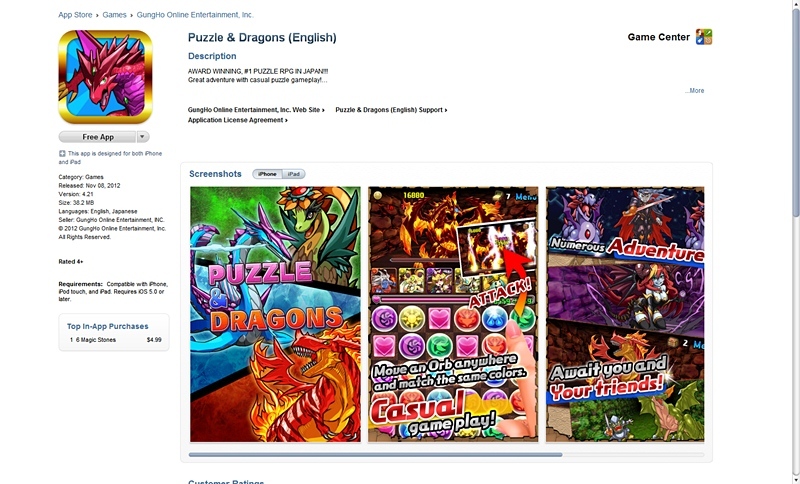 As Puzzle & Dragons is a freemium game, it contains in-app purchases as well as a restriction of how much time you can spend playing. The restriction in this case is known as Stamina. But wait!! Don’t stop reading yet! It’s not as bad as you think! If you’re impatient, you can always use Magic Stones to restore your Stamina gauge to maximum. Of course, free Magic Stones are conveniently difficult to come by in-game. In fact, the Shop icon is a subtle reminder that you can always purchase more! Dungeons are categorized as Normal Dungeon or Special Dungeon. The main differences between the two types are dungeon length, stamina cost, and enemy levels/strength. Normal Dungeons have less stages that require low stamina to enter. They also contain more or less managable opponents. Special Dungeons are the exact opposite. Actually, Special Dungeons are only available for a certain amount of days and are a good source for money (and probably rare monsters). Both dungeon types have stages that vary in length and number of enemies, but the final stage always contains a boss battle where you can either fight one beefy monster or take on several beefy monsters at once. If I remember correctly, the screencap at the top is a boss fight within one of the special dungeons. There’s no real objective in the game, I don’t think. All you do is go around beating up other monsters and collect gold and eggs. These eggs are hatched upon completion of a dungeon stage and you will either get a regular monster (which come from a polka-dotted egg) or a rare monster (which pop up out a striped egg). Oh yeah, completing dungeons nets you experience too! When your EXP bar is full, you will level up in rank and your Stamina gauge will replenish. You also unlock the feature to gift friends once you reach rank 20. There are probably other features that are dependent on rank that I’m not sure about though. .___. Currently, there are 200 collectible monsters but I’m not sure if they can all be captured since the ones in the compedium seem to be either the ones you own or the enemy monsters. For some reason, ally monsters from other users don’t show up. Most monsters have special active or passive skills that can be used in battle if the conditions are met. The conditions I’ve seen so far only call for a fixed number of turns. In terms of active abilities, they can be buffs, debuffs, restoration of the team’s health bar, or some sort of attack. Passive skills can consist actions like of counterattacking when hit or restoring a small amount of HP per user turn. There are also monsters that have a Leader Skill which obviously only become available when placed in Leader slot. I’m uncertain of this but I think the party member you assign as a Leader becomes the guest character that other players can take with them into their fights. You are free to configure your party in any way by choosing from the available monsters in your inventory. While variety is a good idea, adding several of the same elemental type will increase their attack power. The only catch when outfitting the team is that their combined cost — in the right image above, each monster’s value is indicated below their level — cannot exceed the allotted team cost. Using the screenshot on the right, you can see that my limit is 26 but I’ve only used up 22. Fusing monsters is the only way to level them up or evolve them. The latter requires them to be at their maximum level where you can then synthesize them with other maxed out monsters. The resulting monster will be one of higher grade. I’m not sure any fusion can fail but given the rarity of some of the “ingredients”, as well as the cost of the whole process, I don’t believe it’s possible. Monster grades are indicated as stars on their profile cards. One star is the lowest possible grade and usually max out at level 10. As the stars increase, the maximum level also rises. As I’m early in the game, I don’t know what the highest grade would be but I’m guessing it’s 4 or 5 stars. I don’t them and they don’t know me but we’re friends! I opened this overview by stating that Puzzle & Dragons is a semi-social game. By this, I meant that part of the gameplay gimmick is that you can obtain Friendship Points (FP) from opting to take someone else’s monsters out with your group. Er, incidentally, the games labels the name of these points in Japanese which is 友情ポイント. Everyone starts off as strangers and it will remain so unless you actually go out of your way to become acquainted with them through the game’s messaging and gifting system. You only gain 5 FP from an outting from strangers. However, once they become “friends”, you will get the obtain 10 FP. Unfortunately, all these Friendship Points, whether they’re from strangers or friends, can only be received once by day. Oh, I forgot to mention, since this is a free title from the Japanese App Store, you can create an iTunes Japan account to download it to try it it out for yourself! You don’t need to enter any credit card information at all~! Hi there! I was searching for some english sites about this game and chanced upon your blog! how far are you into the game now? There is something about the increasing of level of your monsters’ skill that i don’t know about. dont really understand the japanese but i’ve played for quite some time haha. nice to know that english speakers play this too! Hooray! Another player! XD I’m actually surprised GungHo hasn’t released a localized version yet. In a way, I hope they don’t or else I’ll be spending lots of money buying Magic Stones in THAT one. XD I already spent more than I should have in the JP one. Anyway, are you asking about the option I highlighted in the left screenshot below? That’s for evolving your monsters! 😀 You can only do it if you a) get all the fusion/catalyst monsters and b) max out the monster you want to evolve. In the right screenshot, I have all the fusion monsters needed. The numbers underneath each of the monsters just shows the quantity I have in my Monster Box. Hey there! I’m playing it too and I’m just wondering how do you actually GIFT friends when you’re Rank 20? http://p.twimg.com/Aq5NdJxCQAE1wUf.jpg dont understand how to upgrade the skills. Ive seen “friends” with skill level maxed out and they do really massive damage compared to me. Haha no worried dude! It’s nice to see English speaking players for a fully Japanese game. I can’t copy that text to google translate if not I’d have done it. It’s one of those tips that randomly appear after you finishes a dungeon. I play quite often (actually very often) so maybe that’s why! Just earn money and keep making the monsters stronger. Some days youll get free Magic stones from the developers but I’m not sure why. By the way I’ve sent u a request! It says that if you fuse a monster with a monster that has the same skill, the skill level will go up. By the way something weird just happened! I was trying out this gifting feature when I went to the “friends” tab and tappe the fifth option. I was prompted to choose a friend and after that I was brought to a golden gacha dragon and got a little dragon from there that went into my inventory! Not that I’m complaining as I don’t have that dragon, but I don’t know what happened! Hi, just to reply to you, you can send one and only one friend a gift when you hit rank 20. To upgrade skills, you merge the pets with the same skills in order to level that particular skill up, Hope this helps you! Hi! Thank you! I found that out myself kinda randomly. Do you wanna leave your ID for me to add? I wanna add more English speaking friends!! By the way koukoupuffs, merging monsters with same type will receive bonus exp! Does anyone know what’s monster No. 176 used for? The cute sitting dragon-like thing. Hi Yuling, i’ve added you! That dragon is purely for merging with your main monsters to increase their level. Certain times during the day, there will be a random 1hr ‘urgent’ quest where there are no. 177 and 178. 178 is worth the most exp. Koukoupuff, try to get some dragons from the friendship gacha! This week there’ll be more rare monsters that’ll help! For those who understand a bit of chinese, there’s a chinese wiki page here http://zh.pad.wikia.com/index.php?title=Puzzle_%26_Dragons_%E7%BB%B4%E5%9F%BA&variant=zh-tw. – Is there a player level limit in the game (max level)? – for the special dungeon, particularly the dragon boss dungeons, do those boss drop their egg as well? Hi, there is no limit to your level. I have “friends” on my list over 160 and I’m about 120. Also, about the Metal dragons special dungeon, do you have a recommended minimum level for a successful run? I seen the data from the wiki source and most metal dragons have over thousands defences…. Yup but their attack aren’t that high too. It’s worth it going for that metal dragon dungeons cos the king one gives really tons of exp for your monsters. Im not sure what level is recommended though since i only discovered it a bit later on. Managed to level today and have 1 extra slot available for the list. Hey guys, my friend told me that there will be localized version of this game. Is it true? They’re probably talking about Angel Salvation (https://koukoupuffs.net/2012/09/09/angel-salvation-puzzle-dragons-skinned-for-the-western-audience/). It’s a knock-off by a Chinese company. GungHo North America IS planning on releasing P&D in NA soon so stay tuned! Hi, I just stumbled upon this article today. 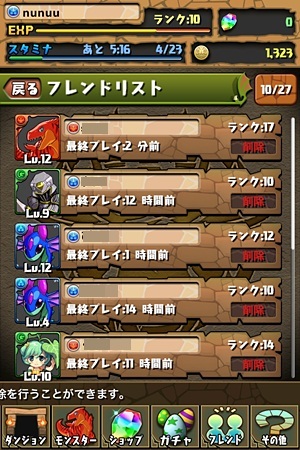 I live in Japan and am an avid player of the Japanese P&D. I’ve always wanted to build an English P&D wiki database from the wealth of information I’ve received while playing and discussing with other players. If this sounds like something some of you may be interested in, let me know! I’m also a translator, so feel free to throw anything Japanese my way. Hi Anthony, may I know where do u usually discuss the games with other players? Some online forums? I’m a bit interested but how are you gonna go about doing it? After thinking it over, the best format would probably be as a smartphone app, but that would mean I’d have to learn how to develop for both iOS and Android. Add or send me message through here and we can chat. Without disturbing the author here with notification emails! As for the app, ah I wish I can help..
Looks like your friend list is packed, lol. Also, I don’t have access to your profile, so I can’t get your contact info. What to do? There’s an English version released for both iOS and Android. If you wanna create combos this may helpful. The app name is “Big Combo”. iOS/Android. 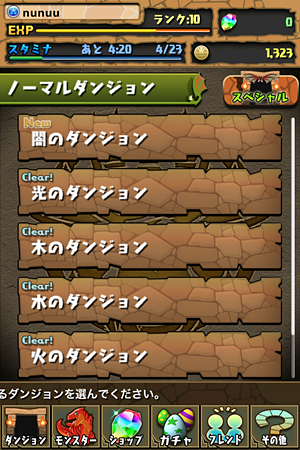 I used it for Zeus dungeon.